It's funny but you never know who you are going to meet, and under what circumstances. I regularly review the public productions at The Arden Theatre School in Manchester, and whilst waiting for the auditorium to be opened one afternoon I found myself chatting to one of the teachers there, Risa Hall. Through the conversation it became clear that she was an extremely talented individual who has, to date, led quite an interesting and fulfilling life. I have to be honest and say that the name Risa Hall meant absolutely nothing to me prior to this, despite having seen her at other Arden performances (she teaches voice there). However, I have now discovered that she is also a talented actress, voice-over artist, but mostly and primarily a singer / songwriter. Her music is all over YouTube, iTunes, Spotify and other such places, and she performs regular gigs around the city with her fellow band members. The reason I haven't come across her before though is simple. My musical tastes are classical and Musical Theatre, and have really never 'got in to' the more popular music styles which each generation of teenager will bop, head-bang, sway to or whatever the trend dictates. However Risa sent me a few of her latest recordings to listen to, and I did. What I listened to however was not the inane repetitive chord structures, melodies and lyrics of some or even most artistes of the popular music world, but an intelligently thought-out and complete song narrative with a varying and eclectic array of music styles. Each one fitting the lyric and each one as different as chalk and cheese, and yet all, somehow, unmistakably by the same artiste. Few truly greats have managed to accomplish this. I think of the likes of Bjork or Kate Bush, Madonna or even Paul McCartney - continually reinventing themselves to suit the mood of each song they write. Hall's music is sometimes rock, sometimes folk, sometimes jazz or blues and there's even a hint of the Musical Theatre style in there too; and yet the next track is funk or punk. Here is a singer / songwriter who knows how to express her feelings and to know the correct music genre in which to do that. So let's take you back to the beginning, and how it all began. Born in New York to a musical family, her mother was both a pianist and guitarist, whilst her stepfather went to school with Tony Bennett and played trumpet in the Big Bands with Tommy Dorsey. As for Hall herself, she went to school with The Ramones and has continually hob-nobbed with the music elite all her life, Paul Burgess (10cc) and Nigel Stonier playing backing and producing for her. She married an English bass player and moved to 'Manchester, England'. However, she is now on husband and bass-player number two! Her music has been played on US and British radio, and she has had her tracks 'Inconsistently Consistent' and 'Sixth Sense' on the iTunes Top 10 Bestsellers pre-order list, whilst four of her singles have made 'Single Of The Week' on HCRFM and Tunatheday. Her latest release is a collaboration with ex-Arden student King Al, who has already found attention for himself within the industry having been selected as a BBC Introducing Artist, called 'Waiting For You'. 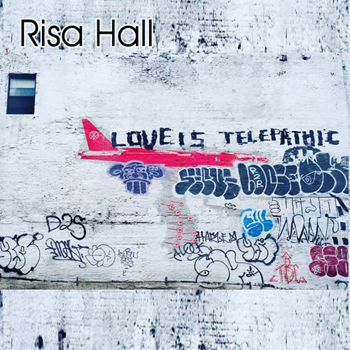 Risa Hall's latest 9-track album Love is Telepathic is now available on iTunes and there's plenty of stuff on YouTube for you to watch and listen to before deciding to purchase her latest recordings. Just goes to show, you never know who you might be rubbing shoulders with, doesn't it?